Certain plants lure, capture, kill and digest animal prey. Bladderworts (Utricularia spp.) comprise more than 240 species and constitute the largest genus of such carnivorous plants. They can be found almost worldwide in a variety of different habitats. Whereas their delicate flowers are often quite eye-catching, the rest of the plant is rather inconspicuous – their carnivorous traps are usually even hidden underneath the soil or water surface. The traps are typically only several millimeters long, hollow vesicles that work underwater by means of a suction mechanism. Through energy-demanding processes water is expelled from the trap lumen to the outside generating underpressure inside the trap. Any small aquatic or thin water films in the soil inhabiting prey animal (typically small arthropods) that triggers the trapdoor will entail door opening and an inrush of water and prey into the trap within only a few milliseconds. Afterwards, the trapdoor recloses, and the prey is enzymatically degraded and the nutrients taken up by the plant. The trap may also fire spontaneously (i.e. inhaul water by opening the trapdoor without triggering by prey), when the continuous increase of underpressure becomes critical, which as a side-effect may lead to accumulation of biomass from the surrounding medium (algae, detritus) inside the trap and adds to the bladderwort’s nourishment. Fig. 1. Different life forms and traps in carnivorous bladderworts (Utricularia spp.). A) Aquatic free-floating U. australis in its natural habitat. Note the numerous traps attached to the branched leaves. B) SEM image of a dissected suction trap of aquatic U. vulgaris. The edge of the trapdoor (de) and the threshold (th), on which the door rests, are indicated. Image modified from Poppinga et al. (2016) AoB PLANTS (doi:10.1093/aobpla/plv140). C) Terrestrial U. cornuta, cultivated in the Botanic Garden Freiburg. When taking the plant out of the pot, the numerous root-like sub-terrestrial structures bearing a multitude of tiny traps become visible. D) SEM image of a dissected suction trap of terrestrial U. menziesii. For abbreviations see B). In contrast to U. vulgaris, the trap entrance is tubular. Image modified from Westermeier et al. (2017) Sci Rep (doi:10.1038/s41598-017-12324-4). E) Flowers of terrestrial U. multifida. F) The traps of terrestrial U. multifida are likely to display an “ancestral” passive trap type. E & F) modified from Poppinga et al. (2018) AIPC Magazine. The biophysics and functional morphology of the trap allowing for such an extraordinary plant movement have been previously thoroughly investigated in free-floating aquatic bladderwort species (Fig. 1 A,B), which, however, comprise only ~16% of the species within the genus. The majority of species are terrestrials in the widest sense, comprising plants affixed to the soil, including epiphytic (growing on other plants) and lithophytic (growing on rocks) species (Fig. 1C-F). Hence, we were wondering how these species, which are not constantly surrounded by a water body, capture their prey, and whether they possess certain structural adaptations in their traps to ensure functioning in the respective habitat. Based on comparative biomechanical and functional-morphological studies, we can distinguish between different Utricularia trap and trapdoor movement types, referencing differences in functional principles (suction traps vs. passive lobster traps, the latter only found in U. multifida), entrance morphology (short vs. tubular), angles between the doors and the thresholds (obtuse vs. acute), and trapdoor motion. In order to understand these trap and trapdoor movement types in an evolutionary context, we employed a refined phylogenetic reconstruction of the genus based on new molecular data. The three major phylogenetic clades correspond well with the observed functional, kinematical and morphological characteristics. In our study of the phylogenetically early-branching U. multifida (Fig. 1 E,F), no active suction mechanism could be observed, although the plants investigated were healthy and physiologically active (indicated e.g. by organ reorientation during the experiments, and some trapped prey was found inside the traps). Therefore, we propose a new, passive trap-type, which presumably works similar to the lobster-traps of closely related carnivorous corkscrew plants (Genlisea spp.). Moreover, in contrast to the other species, U. multifida does not fire spontaneously, which otherwise seems to be a universal trait in the genus. Hence, U. multifida (and most likely its two closely allied relatives) are likely to represent an “ancestral” passive trap type, in which prey probably enters the traps actively through a flap-door, comparable to a cat-door. This trap type might have been realized in early evolutionary lineages of Utricularia, leading to the fast-moving active suction traps we observe nowadays in the majority of the more than 240 species. It is quite likely that the evolution of fast moving suction traps from passive ancestral traps represents a so-called “key innovation” which boosted speciation in the genus. 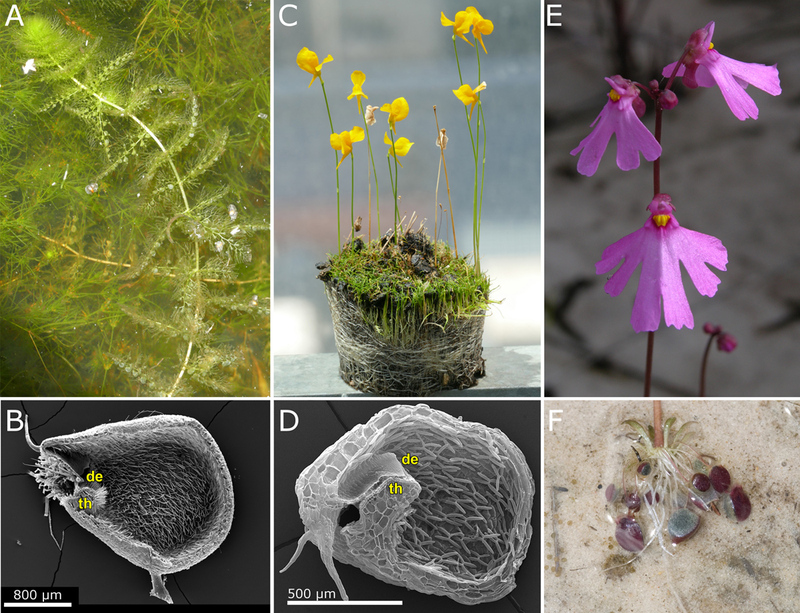 Trap diversity and character evolution in carnivorous bladderworts (Utricularia, Lentibulariaceae).